The 86-passenger S.S. Legacy is a replica of an early 20th-century coastal steam ship, with a Victorian look and feel -- making it stand out from the rest of UnCruise Adventures' fleet. A 2018 refresh brought the ship up to the adventurous standards of the cruise line, adding skiffs (rigid inflatable boats used for getting to and from the ship) and kayaks, but it still retains an old timey vibe that belies its commitment to active pursuits ashore. Comfortable cabins and adventurous excursions. No cabins with balconies and no Wi-Fi. 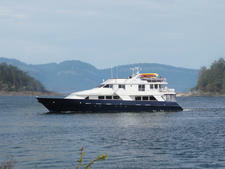 A comfortable ship with excellent service and amazing onshore offerings. 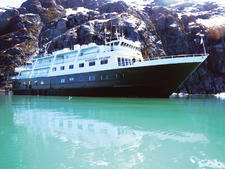 Its dated appearance aside, S.S. Legacy is a comfortable base from which to explore Alaska and the Pacific Northwest -- the only two regions the ship sails. Rooms are decently sized with comfy beds with mattress toppers, there are informative and interesting lectures most evenings and food is, generally speaking, enjoyable. S.S. Legacy is also an easy ship to navigate; there are four passenger decks (with an elevator going between three of them), one restaurant and one lounge, so it's impossible to get lost. 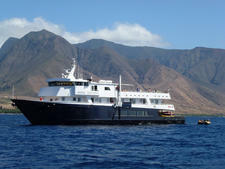 There are passenger cabins on all decks, with the bulk of the rooms on Decks 2 and 3. (All of these lead directly out onto an outer deck; cabins on Deck 1 are accessed via an internal hallway). If you've been on a big cruise ship before, being on such a small vessel might feel strange, but unless you're spending a lot of time in your cabin, it never feels claustrophobic and you're usually too busy during the day to get bored. A unique aspect of sailing on S.S. Legacy (as on all UnCruise sailings) is that there are no room keys. You can lock your room when you're inside, but once you leave, there is no way to lock the door; UnCruise crew onboard said they've never had a single theft. It's just that kind of cruise: laid-back, informal, friendly. It's not uncommon for someone to pop out their door in the morning to take in the beautiful views and bump into a neighbor or two and start chatting. Another surprise you'll encounter on S.S. Legacy is its lack of Wi-Fi. While not as noticeable in the Pacific Northwest where your cell phone service will work most of the days (though not all), in Alaska the lack of Wi-Fi is sorely felt. Service onboard is also friendly, and the all-American crew quickly get to know your name and what you like (whether it's your drink of choice in the Lounge or how you like your eggs cooked in the Restaurant). But, like all UnCruise sailings, what really makes a cruise special on S.S. Legacy is not just its good food, attentive crew and friendly passengers, but the amazing adventures in gorgeous places you can have, from kayaking up to the face of a glacier to whitewater rafting on a tributary of the Columbia River. Who you'll be sailing with on S.S. Legacy is typically determined by where you're sailing. 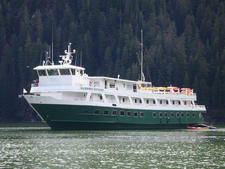 S.S. Legacy itineraries in Alaska generally attract people in their 50s and older, with a smattering of families. Columbia and Snake River sailings, on the other hand, skew older with an average age around 70. There is no dress code on any S.S Legacy sailing and you do not need to wear anything special for meals. People tend to opt for comfortable activewear that can be layered when off the ship, along with any specialty gear that might be needed for Alaska cruises. At dinner you might see men in trousers and button up shirts and women in skirts and a blouse, but you don't need to dress up if you choose not to. Check out the recommended packing list from UnCruise for your particular sailing for specifics. 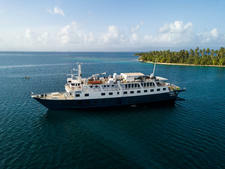 All UnCruise Adventures sailings are all-inclusive, meaning all shore excursions, meals, drinks and transfers to and from the airport are included, as is a pre-cruise hotel night. 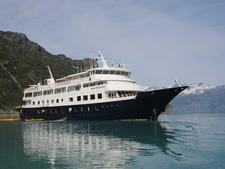 Gratuities, however, are not included and UnCruise recommends between $25 and $30 per person, per day. Tips for third-party guides (on the rafting trip, jet boat, etc.) are also not included, but are entirely at your discretion. There is no Wi-Fi onboard S.S. Legacy. 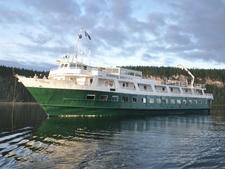 Expedition-style cruising in Alaska for up to 74 cruisers; friendly onboard vibe with nature guides and active excursions that include hiking, kayaking and skiff sightseeing.